Application of the analytic ultracentrifuge to lipoproteins began in 1935 with McFarlane’s studies of normal and pathological serum, by which were unexplained multicomponents and distortions in the region of the albumin boundary. In 1948, Gofman and coworkers started their studies at Donner Laboratory with the newly developed electrically driven Spinco analytic ultracentrifuge designed by Pickels. In their work, there usually developed, after prolonged ultracentrifugation of undiluted sera, an actual dip below the baseline. Raising the serum density to 1.063 g/ml resulted in the elimination of the dip phenomenon and the density sensitive "X protein" floated, giving an inverse peak as predicted. The past 43 years have seen great development in all aspects of lipoprotein study. Much of this was made possible by the analytic and preparative ultracentrifuges developed by Pickels. 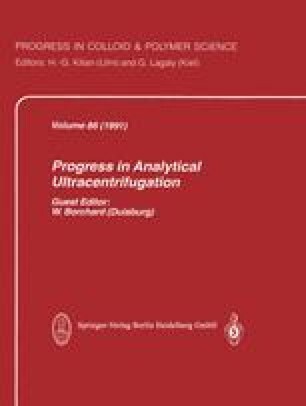 — At Donner Laboratory, ultracentrifugal flotation techniques have been developed and refined over the past 35 years. Important technological details include the fabrication of improved analytical cells and special offset centerprieces. The manufacturing of epoxy molds and the fabrication of double-sectored centerprieces are illustrated and described. To eliminate rotations of the cell during acceleration, cell housings are slotted and rotors are pinned for precise radial alignment. All phases of data acquisition and E machine control are accomplished by a micro-computer. Tracings of the Schlieren plots are processed by a VAX station 3200 with almost instantaneous numerical and graphical output.